Earrings are never regarded as a mere jewel; it is a statement of ones passion and tastes. Beautiful earrings are adored by ladies. The value of a pair of earring goes far beyond its monetary value; its true value is the beauty that it adds to a pretty face. No matter whether earrings are made out of diamonds or beads, gems or synthetic pieces of glass, the fact that it enhances the true feminine grace of a lady at anytime and anywhere is what matters the most. Browse through our wide range of hand-made earrings to choose the perfect pair for the right occasion, time and face. Show your love to a special lady in your life with a classy pair of chandeliers, gemstone designs or hoops from Your Craft Fair. An array of vibrant bead earrings is available at Your Crafts Fair to satisfy all your earring needs. This trendy range of earrings is ready to suit a funky outfit as well as an elegant evening gown. Be envied by your friends with a unique style of beads dangling down your ear lobes. Impress your colleagues with a stylish yet simple pair of bead hoops during your work hours. Wood earrings carry a tribal aura with a mysterious but classy look blended into it. Our collection of wooden earrings would be the ideal choice for an outfit with an oriental touch. Different shades of wood chunks and beads have been mixed together to accentuate the beauty of the wooden earrings. Mix the colourful bead and metallic fusion is a definite choice for funky lovers. Bead and metallic mixes have been specially loved by the teens and the young population. Your Crafts Fair offers you the most enchanting pairs of bead metallic mixes for an extremely reasonable price. Do not forget to stop at our online store to buy your special someone a pair for her next birthday. Loved by women of all ages in all times, stone earrings have gained its popularity among all generations. The synthetic pieces of glass and semi precious stones have been converted into fascinating earrings that has the power to transform your looks from ordinary to gorgeous within minutes. 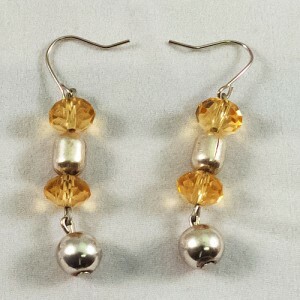 Irregular pieces of yellow opal, obsidian, olivine, mother of pearl are ready garnish your appearance in any occasion. Shop at Your Crafts Fair online store for beautiful earrings at amazing prices.